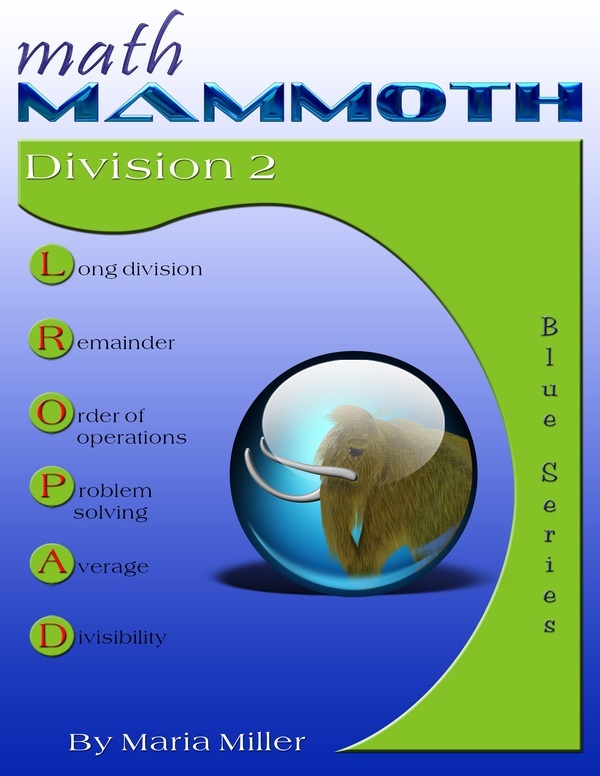 Math Mammoth Division 2 is a continuation from the Math Mammoth Division 1 book. It includes lessons on division, long division, remainder, problem solving, average, divisibility, and factors. The book is most suitable for fourth grade. We start out by reviewing basic division with single-digit numbers. Then students study division terms and dividing by whole tens and hundreds. The lesson Finding Fractional Parts with Division shows an important relationship between fractions and division. For example, we can find ¾ of a number by first finding ¼ (divide by 4), then multiplying that result by 3. Next we briefly study the order of operations, this time including division in the problems. In the lesson The Remainder, Part 1, we study the concept of remainder, first using pictures and small numbers. In the second lesson on remainder, we still use small numbers, but students work the problems using the long division symbol or “corner,” as I like to call it. That is of course preparing them for long division. Next, long division is taught in several small steps over many lessons. We start with the situation where each of the thousands, hundreds, tens, and ones can be divided evenly by the divisor. Then the remainder is introduced in the ones. Next comes the situation where we have a remainder in the tens. Finally, we have a remainder in the hundreds, and so on. We also have lots of word problems to solve. After long division is mastered, we study the concept of average and problem solving involving a fractional part of a whole. I have included many bar diagrams and pictorial representations of these problems to help the students. The last section deals with elementary number theory topics. We study some basic divisibility rules (though not all of them), prime numbers, and find all factors of a given two-digit number. Answers are appended to the end of the book. See more Math Mammoth videos! I downloaded Division 2 for my son who was struggling with remembering the process of division and making so many errors. He's nearly done with the workbook. I just wanted to say that I am very pleased with the results. He is quite fluent now and I'm checking out your other workbooks. I appreciate the use of grids to work out problems and the number of word problems. Thank you! 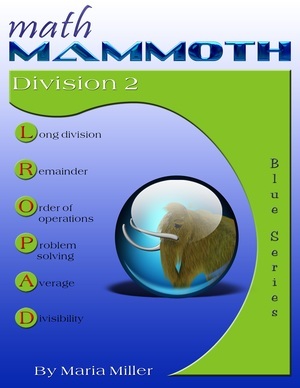 Math Mammoth Division 1—a worktext dealing with basic division concept, division tables, remainder, and word problems (grade 3). Math Mammoth Multiplication 2—a worktext about multi-digit multiplication, order of operations, estimation, and word problems (grade 4). Math Mammoth Multiplication & Division 3—a worktext about multi-digit multiplication and long division with larger numbers, ratios, simple equations, divisibility, primes, and factoring (grades 5-6).